Alicia Skinner Photography is back in full swing! We recently took a small hiatus while we moved. I can’t wait to get back to my passion of photographing newborns, baby milestones and cake smashes. Oh, how I have missed it! 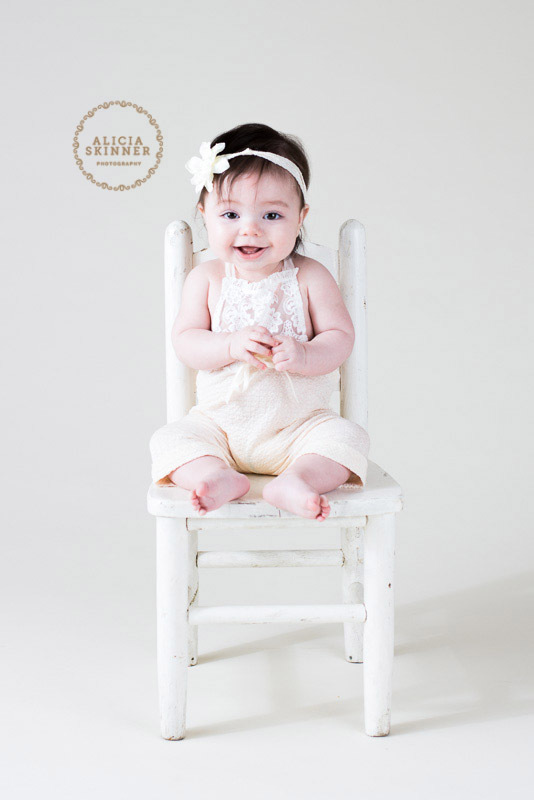 I can’t believe this little sweetheart will already be doing her one year photos and cake smash with us here soon. It seems like just yesterday that she was here for her “sitting” baby milestone photos! Just look at those cheeks and that smile! Sweet baby Tabitha is just as cute as can be and wasn’t a bit shy in front of the camera. One of my favorite parts of this job is watching their personalities develop over the first year and I’m always honored to play a part in capturing this amazing timeframe in their lives. I can’t wait to see you again soon for your first year cake smash, sweet baby girl! I only photograph a select number of newborns and babies each month to ensure you receive the personalized service you deserve. Learn more about our newborn sessions and first year milestone baby plan by perusing the website or reaching out to me directly. If you or someone you know has been looking for a Dallas baby photographer, you can contact me today to schedule your complimentary consultation to learn more about starting the planning process! I look forward to meeting you!